Today's. It's so hot in the craft room though, I had to give up after 2. Grrrrrrrrrrr!!!!! lol. Oh wow, I really love the second one. 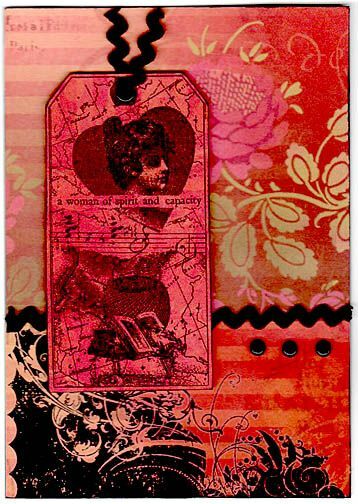 Did you make the tag from scrap too or was it already made? Scrap too, Maria. Stamped onto paper. I don't know what to say - these are gorgeous too, Lorraine. If that's what you can do with scraps, I suggest you save money by asking us for all of ours, then you can make cards for nothing! You have inspired me to get into that box called "offcuts" and do something with them all - or at least some of them! Gorgeous cards. 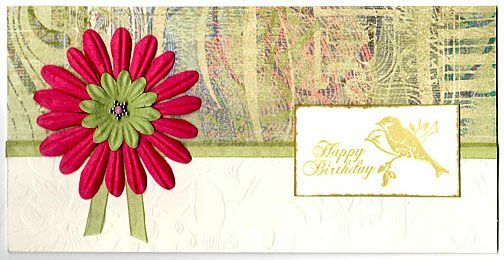 Lovely cards, what great scrap you have. I have to say though, I don't know about your monitors but they look awfully vibrant on mine. The top flower isn't bright red, it's more a fuchsia colour and more closely matches the pinks in the paper and the tiny centre brad. I think it's much nicer in real life and the red card isn't quite as vibrant either. Summat wrong with the upload methinks. Wow to the second one - that is yummmmmmmmmmmmmy. Perhaps that is another swap/challenge in the offing. Using offcuts to make a card. Yeah, well I thought of it for a challenge, Steph but I can't see enough time at the mo while all Kim's are ongoing. It'll keep. Two beauts Lou, love the red one. Lou, these are stunningly beautiful. I love both of them.